What are sunsets on Mars like? Matt - They do, yes. Sunsets are obviously caused by our Earth is rotating and so, just from our point of view, when our planet swings round we can see the sun again; that’s the sunrise. And Mars is a rotating planet just like Earth so there are sunrises and sunsets on Mars. There a bit strange though because the martian atmosphere is quite different to Earth’s atmosphere. 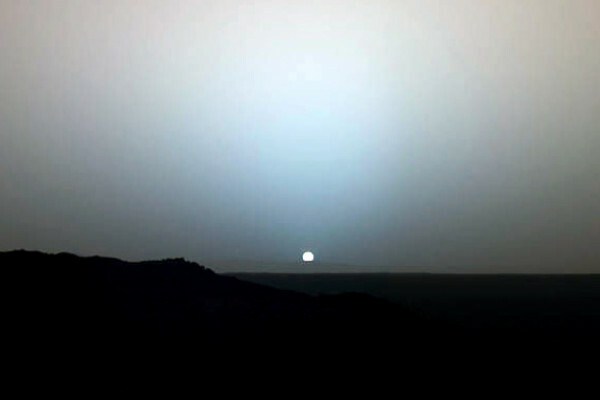 Sunsets on Mars are actually blue rather than the kind of reddy orangey sunsets that we’re used to here on Earth. Chris - Really! Blue, why are they blue? Matt - It’s about the composition of the atmosphere. Earth’s atmosphere is gassy and fairly dense, and so when the sunlight passes through Earth’s atmosphere the light is getting scattered by very very small particles. The kind of molecules of nitrogen and oxygen in the air. Mars’s atmosphere is very thin and very dusty, so the scattering is getting done by dust particles instead and they’re much bigger, and so there’s a whole different mechanism that does the scattering. So, in fact, the way dust particles scatter light is that blue light, the short wavelength light, gets scattered forward towards the observer so if you’re watching the sunset on Mars it looks blue. Chris - Because on Earth, the tiny particles scatter the blue light so your brain is seeing blue coming from all across the sky, so our brain tells us the sky is blue, and the Sun looks a little bit yellower as a consequence. But when the Sun gets down to the horizon on Earth, it does look red presumably because it’s had lots and lots of blue light taken out? So therefore, on Mars, if you’ve got lots and lots of the blue light actually coming straight to you but the red light’s coming out because the big dust is scattering the red it’s going to look bluer, the more atmosphere the light comes through, which is why you’re saying it does look bluer towards the end of the day? Chris - Presumably, as it gets towards the horizon, that effect is going to become more and more acute because the path of the light is greater through more of the atmosphere so you’re going to see more of that blue effect? Matt - Exactly. The Sun in the martian sky looks fairly like the Sun in the Earth’s sky, apart from a bit smaller, but as it gets lower and lower towards the horizon it looks more and more blue. Kate - Is there a green flash that happens on Mars’ sunset or something with a different wavelength when the last little bit of the ellipse of the Sun passes below the horizon just at that very last moment? Chris - Have you seen it? Is it real because people refer to it but I’ve never seen it? Kate - It’s highly debated. I’ve done a lot of research sitting on a beach at sunset, usually with a beer. Chris - With a tequila or something? Kate - What we specifically watch it for is the green flash. And the theory behind it seems plausible as far as scatter and everything. Chris- So, green flash, yes or no on Mars? Matt - The green flash is absolutely real. I’ve never seen it myself so just in the same way that you’ve been looking for it. I think it’s a bit of a tradition amongst astronomers if you’re observing at an observatory or something to go out at sunset and try and see a green flash. I’ve never been able to see one, but as far as I know there should be a green flash on Mars. Previous Why don't red blood cells have DNA? Next Why do you get transparent animals in the sea but not land? How long are the seasons on Mars? Recent podcast talked about sunset on mars. Here’s sunrise from orbit. Note light in cupola is red due to oblique filtering of sunlight. A deep blue thin line at the horizon is our familiar blue sky. This phenomenon last Only a few seconds. 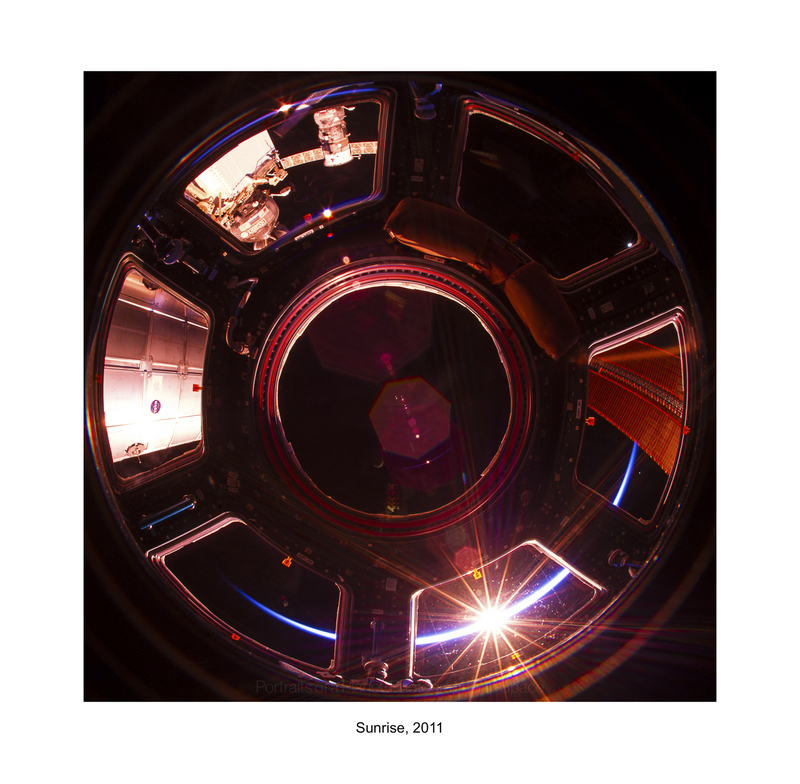 Sunrise is only tel seconds long on the ISS. Photo by NASA astronaut Donald Pettit.